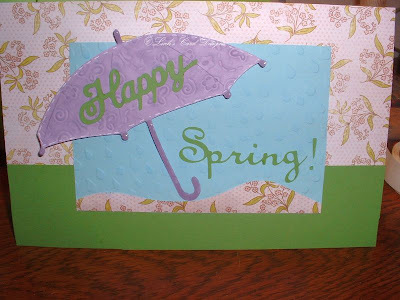 I made this card yesterday. I keep looking at it like there's got to be more to it. I embossed the umbrella with butterflies and swirls. The blue is also embossed with rain drops. Thanks for looking~ if you think it needs more as well then let me know. Again thank you for stopping by....happy spring to you! !